Department of Biotechnology 1, Periyar University PG Extension Centre, Dharmapuri - 636705, Tamil Nadu, India. Department of Microbiology 2, Vivekanandha College of Arts and Sciences for Women (Autonomous), Elayampalayam, Tiruchengode, Namakkal - 637303, Tamil Nadu, India. ABSTRACT: Objective: The objective of this research was a synthesis of silver nanoparticles from Murraya koenigii leaves in which the particles were characterized by various techniques and to evaluate the potential antibacterial activity of synthesized nanoparticles against various human pathogens. Methods: Murraya koenigii aqueous extract of leaves were prepared by the Soxhlet method, and the bioactive compounds were analyzed by phytochemical analysis. Silver nanoparticles were synthesized which are characterized by UV-visible spectroscopic analysis, XRD, TEM, FTIR analysis and antimicrobial activity was evaluated by agar well diffusion method. Results: Phytochemical analysis of Murraya koenigii aqueous extract of leaves showed the presence of alkaloids, phenols, flavonoids, terpenoids, coumarins, and steroids. 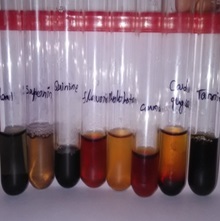 The aqueous AgNo3 solution changed from green to dark brown color after incubation. 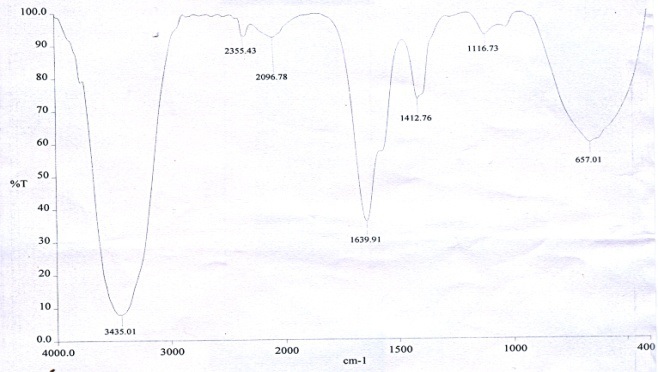 UV-visible spectroscopic analysis showed the absorbance peak at around 420 nm which indicates the synthesis of Ag NPs. 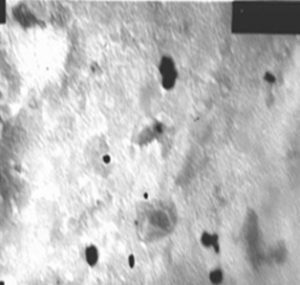 TEM image showed the formation of well-dispersed silver nanoparticles in the range of 5-25 nm. X-ray diffraction (XRD)-spectrum as evidenced by the peaks at 2θ values of such peaks 38.43°, 44.40°, and 67.57°, is corresponding to 111, 200 and 220 planes for silver, respectively. Silver nanoparticles showed the antimicrobial activity against Staphylococcus aureus (16mm), Escherichia coli (15mm), Salmonella sps. (15 mm), Bacillus sps. (16mm), Vibrio sps. (14mm), Enterococcus sps. (13mm) and Candida (21 mm). Conclusion: This study demonstrated that the silver nanoparticles from curry leaf extract showed that the remarkable antibacterial activity against human pathogens. The extract of Murraya koenigii has the bioactive compounds like alkaloids, phenols, flavonoids, terpenoids and it will become a drug for the therapy of infectious diseases. INTRODUCTION: Nanotechnology means handling of matter on an atomic and molecular scale. Generally, nanotechnology deals with the structure sized between 1 to 100 nanometer in at least one dimension and involved in developing materials or devices within that size 1. Nanoparticle synthesis is an essential area of research in nanotechnology deals with the diverse chemical composition, dimension and controlled mono disparity. Indeed, nanoparticles shape control is a recent addition to the list of demands being made of newly emerging synthetics method 2. Nanoparticles are the fundamental building blocks of nanotechnology. The most important and distinct property of nanoparticles is that they exhibit a larger surface area to volume ratio. Nanoparticles are made from noble metals; in particular Ag, Pt, Au, and Pd. Metal nanoparticles have marvelous applications in the area of catalysis, optoelectronics, diagnostic biological probes, and display devices. Among the above four silver nanoparticles play a major role in the field of biology and medicine 3. Silver has been describing as an ‘oligodynamic.’ Silver is a nontoxic, safe inorganic antibacterial agent and is capable of killing about 650 microorganisms that cause diseases. Usually physical agents such as UV radiation and chemical agents such as chlorine, silver nitrate, etc. are commonly used 4. Silver has been widely used for the development of many biological and pharmaceutical processes, products, and appliances such as coating materials for medical devices, orthopedic or dental graft materials, topical aids for wound repair, water sanitization, textile products, and even washing machines. The use of nano-sized silver particles as antimicrobial agents has become more common as technological advances make their production more economical 5. In our present study, curry leaves were used as the source. Extraction was prepared by Soxhlet method and bioactive compounds analyzed by phytochemical analysis. 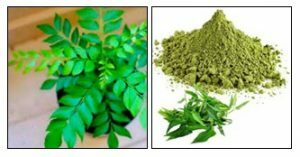 Aqueous extract of curry leaves was used as a reducing agent for biosynthesizing the silver nanoparticles from silver nitrate. After the biosynthesis, the presence of silver nanoparticles was checked by using UV-VIS absorption spectroscopy. The antimicrobial activity was tested with four different bacterial strains such as Escherichia coli, Bacillus subtilis, Staphylococcus aureus, and Candida. Then the size and shape of the silver nanoparticles were characterized by SEM, TEM. The FTIR Study was carried to identify the biological molecules bound with the cell surface. Preparation of Plant Extract: Curry leaves were collected from the local market in Erode district. 50g of dry curry leaf powder in 150ml of water used for the preparation of extraction by Soxhlet method. After extraction the extract was condensed and used for phytochemical analysis. For nanoparticles synthesis, 15 g of curry leaves were dried and cut into fine pieces, and it was crushed with 70 ml of deionized water. The extract was filtered twice through what man no. 1 filter paper. Silver Nitrate: Weighed 0.015 g of silver nitrate and it was dissolved in 70 ml of deionized water. Preparation of Test Samples: 100 ml of curry leaves were added into 70 ml of aqueous solution of silver nitrate for the reduction of silver ions and kept at room temperature for 5 h. After incubation, the solution was centrifuged at 5000 rpm for 20 min. The pellet contains silver nanoparticles, and it was redispersed in de-ionized water for further characterization 7. UV-Vis Spectroscopy: UV-visible spectra were recorded at room temperature for the aqueous solution of metal ions with a respective extract from the wavelength of 200-500 nm at periodic time intervals. Transmission Electron Microscope (TEM): Transmission electron microscopy (TEM) analysis of Ag NPs was performed with Hitachi H-7500, operated at 80 kV. The specimen was suspended in distilled water, dispersed ultrasonically to separate individual particles, and two drops of the suspension were deposited onto holey-carbon-coated copper grids and dried under an infrared lamp. The absorption spectra of the sample were measured by a computer-controlled UV-visible spectrophotometer (DR 5000; Hach, Germany). X-Ray Diffraction (XRD): The silver nanoparticles were freeze-dried, powdered and used for XRD analysis. The diffracted intensities were recorded from 30-80 2Ø angles 8. Fourier Transform Infrared Spectroscopy (FT-IR): To determine the functional groups on the cell surface that may be involved in the nanoparticles synthesis, FT-IR spectrum was carried out. To remove any free biomass residue or compound that is not the capping ligand of the nanoparticles, the residual solution of 100 ml after the reaction was centrifuged at 5000 rpm for 10 min and the resulting suspension was redispersed in 10 ml sterile distilled water. The centrifuging and redispersing process was repeated three times. After that, the purified suspension was freeze-dried to obtain a dried powder. Finally, the dried nanoparticles were analyzed by FTIR. The tested sample was completely dried and blended with KBr to obtain a pellet. The FTIR spectra were collected at a resolution of 4 cm-1 in the transmission mode (4000-400 cm-1) using a Perkin-Elmer FT-IR spectrum 9. Agar Well Diffusion Method: The disc diffusion method was applied to estimate the antimicrobial activity of curry leaf extract Ag NPs against human pathogenic bacteria. The culture of Escherichia coli, Bacillus subtilis, Staphylococcus aureus, Salmonella sps., Vibrio sps. and Candida species were inoculated 25 ml of sterile nutrient broth, and it was incubated for 24 h in a rotating shaker. To evaluate the antimicrobial activity added 100 µl solution of Ag NPs was placed on to the agar surface inoculated with test bacteria. 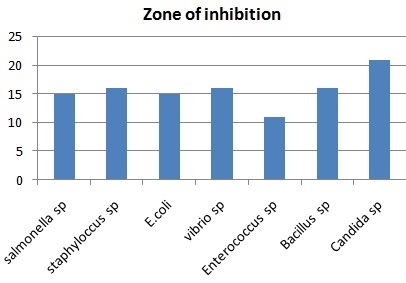 The plates were incubated for 24 h. After incubation, the zones of inhibition were measured. Collection of Sample and Preparation of Extraction: Curry leaves were collected from the local market in the area of Erode district, Tamil Nadu. The leaves were dried and made a coarse powder. Extraction of leaf by Soxhlet method. 50 g of powder yield 6.2 g of extraction. Phytochemical analysis showed the presence of bioactive compounds showed in Table 1. The leaf extract first defatted with petroleum ether and then extracted with methanol which gave 9.4% of extract from 50g of curry leaf powder 10. Synthesis of Silver Nanoparticles: The synthesis of nanoparticles is in the limelight in modern nanotechnology. Biosynthesis of nanoparticles by plant extracts is currently under exploitation. The development of biologically inspired experimental processes for the synthesis of nanoparticles is evolving into an essential branch of nano-technology 11. The present study deals with the synthesis of silver nanoparticles using leaf broth of curry leaves and aqueous Ag+ ions. In the work, silver nanoparticles were synthesized by employing curry leaves extract. Silver nanoparticles exhibit dark brown in aqueous solution. Silver nanoparticles exhibit dark brown in aqueous solution. Silver ion complex was mixed with the green extract it gets started to change the color appearance was dark brown, due to the reduction of silver ions, which exhibit the formation of silver nanoparticles 12. UV-Visible Spectroscopy: The prepared aqueous solution of silver nanoparticles showed maximum absorbance at 420 nm, and it shows the absorbance at 0.824. The sharpening of peak indicated the particles are monodispersed and homogenous. In the silver nanoparticles, suspension release of protein takes place by the aqueous free extract and suggests a possible mechanism for the reduction of metal ions in the solution 13. Reduction of silver ions present in the aqueous solution of the silver complex during the reaction with the ingredients present in the curry leaves extract observed by the UV-Vis spectroscopy revealed the presence of silver nanoparticles may be correlated with the UV-Vis spectra. UV-Vis spectroscopy is well known to investigate the shape and size-controlled of nanoparticles 14. Transmission Electron Microscope: TEM image recorded from the drop-coated film of Ag NPs synthesized by treating AgNO3 solution with curry leaves broth for 4 h. The micrograph clearly shows individual nanoparticles, almost spherical with diameters in the range of 5-25 nm. The measurement of size was performed along the largest diameter of the particles Ag. The Scherrer rings, characteristic of fcc silver, are seen, confirming nanocrystalline nature of Ag NPs as observed in the TEM image 15. X-Ray Diffusion: Further studies were carried out using X-ray diffraction to confirm the crystalline nature of the particles, and the XRD pattern obtained is shown in Fig. 6. The XRD pattern indicates there sharp peaks in the whole spectrum of 2θ values ranging from 10 to 100. It is essential to know the exact nature of the silver particles formed, and this can be deduced from the XRD spectrum of the sample. XRD spectra of pure crystalline silver structures have been published by the Joint Committee on Powder Diffraction Standards. A comparison of our XRD spectrum with the Standard confirmed that the silver particles formed in our experiments were in the form of nanocrystals, as evidenced by the peaks at 2θ values of such peaks 38.43°, 44.40°, and 67.57°, corresponding to 111, 200 and 220 planes for silver, respectively. Table 1 Moreover, the insignificant impurity peaks are observed at 28°, 42° and 46° which may be attributed to other organic substances in flower extract. The Full Width at Half Maximum (FWHM) values measured for 111, 200 and 220 planes of reflection were used with the Debye-Scherrer equation to calculate the size of the nanoparticles. The particle sizes obtained from XRD 83.7nm, 15.9nm and 11.8nm, showed in Fig. 6. 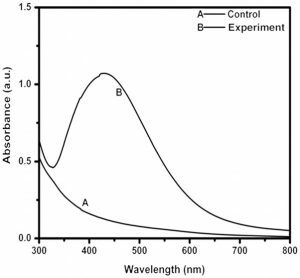 Fourier Transmission Infrared Spectroscopy: The silver nanoparticle solution is exceptionally stable for nearly 65 days with only a little aggregation of particles in solution. It has been reported that proteins can provide a good protecting environment for metal hydrosol during their growth processes 16. FT-IR spectroscopy measurements are carried out to identify the biomolecules that bound specifically on the silver surface. It showed the presence of seven different bands were observed (3435, 2355, 2096, 1634, 1412, 1116 and 657) and four were strong bands. 3435 - OH Stretch, 1634 -Secondary amine NH Stretch, 1412 -Vinyl C-H bend, 657 C-H bends shown in the Fig. 7. Agar Well Diffusion Method: Anti-bacterial activity was evaluated by well diffusion method. 100 µl of aqueous extract showed effective activity against human pathogens. Staphylococcus aureus (16mm), Escherichia coli (15mm), Salmonella sps. (15mm), Bacillus sps. (16mm), Vibrio sps. (14mm), Enterococcus sps. (13mm) Candida (21 mm) showed in Fig. 8 and 9. From these studies evaluate the antibacterial effects against the different organism. When the silver nanoparticles were tested against four species, they effectively inhibited bacterial growth. In contrast, the inhibitory effect of silver nanoparticles was maximum in Bacillus subtilus and Candida. And it shows mild inhibitory effect on E. coli and Staphylococcus aureus species 17. Gram-negative and gram-positive bacteria have differences in their membrane structures, the most distinctive of which is the thickness of the peptidoglycan layer. The lower efficacy in E. coli and Staphylococcus spp. may derive from the differences as a point of membrane structures. Therefore, if the antibacterial effect of silver nanoparticles is associated with the peptidoglycan layer, it will be more straightforward and more specific to use silver nanoparticles as antimicrobial agents 18. It is known that proteins and amino acids tend to reduce Ag+ ions to Ag0. However, it is not yet clear which protein or compound is responsible for bio-reduction of silver. The polyol components and water-soluble heterocyclic components are mainly responsible for the reduction of silver ions. 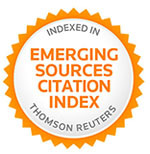 Whereas Shivshankar et al., found that reducing sugars and terpenoids present in leaf broth of neem was responsible for the reduction of silver 19. CONCLUSION: The extract of plant M. koenigii is capable of producing Ag NPs extracellularly, and these Ag NPs are quite stable in solution due to capping likely by the proteins present in the extract. 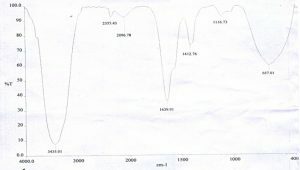 UV spectra analysis showed the absorbance at 420 nm. This is an efficient, eco-friendly and straightforward process. Curry leaf mediated silver nanoparticles having the remarkable antibacterial activity against human pathogens. Curry leaf extract having different bioactive compounds. Silver nanoparticles become a natural drug against human pathogens. ACKNOWLEDGEMENT: The authors are thankful to Prof. Dr. M. Karunanithi, Chairman and Secretary, Vivekananda Education Institutions, and Dr. B. T. Suresh Kumar, Principal, Vivekananda College of arts and sciences for women, Elayampalayam, Tiruchengode, Namakkal District, Tamil Nadu for providing all the facilities for our research work. Buzea C, Pacheco II and Robbie K: Nanomaterials and nanoparticles: Sources and toxicity. Biointer Phases 2007; 2: 17-70. Rajesh RW, Jaya LR, Niranjan KS, Vijay MD and Sahebrao KB: Phytosynthesis of silver nanoparticle using sepium (Jacq.). Current Nanoscience 2009; 5: 117-122. Leela A and Vivekanandan M: Tapping the unexploited plant resources for the synthesis of silver nanoparticles. African Journal of Biotechnology 2008; 7(17): 3162-3165. Pradeep PT: Potential of silver nanoparticles-coated poly-urethurethane foam as an antibacterial water filter. Langmuir 2009; 2: 413-426. Jo YK, Kim BH and Jung G: Antifungal activity of silver ions and nanoparticles on phytopathogenic fungi. Plant Diseases 2009; 1037-1043. Harborne JB: Phytochemical methods. Chapman and Hall Ltd., London, UK, 1973; 49-188. Jain D, Daima K, Kachhwaha HS, and Kothari SL: Synthesis of plant mediated silver nanoparticles using papaya fruit extract and evaluation of their antimicrobial activities. Digest Journal of Nanomaterials and Biostructures 2009; 4(3): 557-563. Vigneshwaran N, Ashtaputre NM, Varadarajan PV, Nachane RP, Paralikar KM and Balasubramany RH: Biological synthesis of silver nanoparticles using the fungus Aspergillus flavus. Materials Letters 2007; 61(6): 1413-1418. Pimprikar PS, Joshi SS, Kumar AR, Zinjarde SS and Kulkarni SK: Influence of biomass and gold salt concentration on nanoparticle synthesis by the tropical marine yeast Yarrowia lipolytica NCIM 3589. Colloids and Surfaces B: Biointerfaces 2009; 74: 309-316. Gupta S, George M, Singhal M, Sharma GN and Garg V: Leaves extract of Murraya koenigii Linn For anti-inflammatory and analgesic activity in animal models. J Adv Pharm Technol Res 2010; 1(1): 68-77. Christensen L, Vivekanandhan S, Misra and Mohanty AK. Biosynthesis of silver nanoparticles using Murraya koenigii (Curry Leaf): an investigation on the effect of broth concentration in reduction mechanism and particle size. Advanced Materials Letters 2011; 2(6): 429-434. Gondwal MA and Pant GJ: Biological evaluation and green synthesis of silver nanoparticles using an aqueous extract of Calotropis procera. 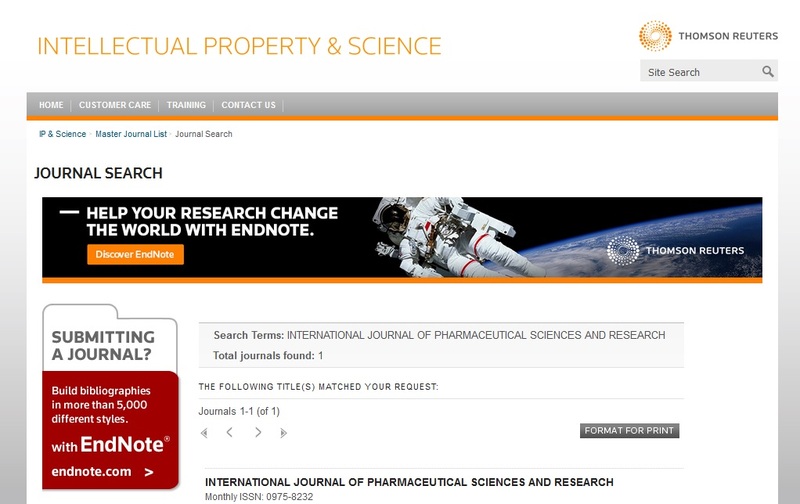 International Journal of Pharmacy and Bio Sciences 2013; 4(4): 635-43. Saifuddin N, Wong CW and Nuryasumira AA: Rapid biosynthesis of silver nanoparticles using culture supernatant of bacteria with microwave irradiation. E-Journal of Chemistry 2008; 6(1): 61-70. Krishnaveni B and Priya P: Biosynthesis and antimicrobial activity of silver nanoparticles from Murraya koenigii, Ocimum teniflorum, Chitin and International Journal of Pharmaceutical & Biological Archives 2014; 5(1): 49 - 55. Jha AK and Prasad K: Green synthesis of silver nanoparticles using Cycas International Journal of Green Nanotechnology: Physics and Chem 2010; 1(2): 110-117. Kim JS, Kuk E, Yu KN, Kim JH, Park SJ, Lee HJ, Kim SH, Park YK, Park YH, Hwang CY, Kim YK, Le YS, Jeong DH and Cho MH: Antimicrobial effects of silver nanoparticles, Nanomedicine. Nanotechnology, Biology 2006; 3: 95-101. Li S, Shen Y, Xie A, Yu X, Qiu L, Zhang L and Zhang Q: Green synthesis of silver nanoparticles using Capsicum annuum extract. Green Chemistry 2007; 9: 852-858. Shankar SS, Rai A, Ahmad A and Sastry M: Rapid synthesis of Au, Ag and bimetallic Au core-Ag shell nanoparticles using Neem (Azadirachta indica) leaf broth. J Colloid Interface Sci 2004; 275: 496-502. Amutha R and Sudha A: Murraya koenigii mediated silver nanoparticle synthesis and its activity against enteric pathogens. Int J Pharm Sci & Res 2019; 10(4): 1906-11. doi: 10.13040/IJPSR.0975-8232.10(4).1906-11. Authors Address: Department of Microbiology, Vivekanandha College of Arts and Sciences for Women (Autonomous), Namakkal, Tamil Nadu, India.